By most conservative estimates, there are not enough people off the Atkins diet in Philadelphia to support the number of Italian BYOBs that have mushroomed like fungi across the city. And yet, business is booming over at Albertino Ristorante Italiano where, as I write, the five-month-old trattoria is in the process of doubling its dining room space. That might not seem like a big deal considering that only 40 diners holding their breath can squeeze into Albertino's original dining room, its walls frescoed with ancient images from Pompeii. But it does speak to the magnetism of this charming little space run by brothers Alberto and Raffaele Gallelli. And it says much about the sudden energy reviving East Passyunk Avenue as South Philly's new Restaurant Row. The area has long been a draw for devotees of the cucina Molisana at Tre Scalini, the old-style pizza pies at Marra's, and the dainty Victorian vibe and pastries at RoseLena's. But suddenly, a flurry of new entries arrived within the last year: two cafes, an artisan bakery, a BYO called Lucca, a BYO called Karina's, and an elegant fountain that would conjure an Italian piazza, save for the fact that occasionally Sinatra croons over a hidden speaker. An ambitiously stylish new wine bar called Paradiso is set to open any day. Slipped narrowly in amongst the crowd, Albertino definitely has its charms - although quiet isn't one of them. One boisterous party of 10, tickled into conniptions by chef Alberto's tiny gnocchi or citrus-kissed "Euro-duck," is enough to quell any hopes of intimate conversation. But if you happen into Albertino on a more reasonably tuned midweek night, this is just the kind of off-center destination that feels like a hidden find. There isn't anything particularly novel about the menu, which has a vaguely Southern Italian bent on the usual assortment of antipasti, pastas, veal and seafood specialties. But there is a consistent quality to the cooking that places Albertino comfortably alongside South Philly's better eateries. Some of the best dishes are simple, but allow their good ingredients to shine. Thick slices of sweet buffalo's milk mozzarella get a variety of irresistible treatments, layered with silken sheets of pink prosciutto one night, stuffed with jewels of lump crab and striped with dark streaks of truffled port sauce another. Raw shiitake and oyster mushrooms soften beneath the flash of a broiler in a gratin dish moistened with white wine and oozy fontina cheese. The artichokes that came pan-fried Roman style were also memorable, their long stems poking skyward beneath a shower of olive oil and roasted garlic chips while their leaves fanned like daisies on the plate. It was, by most standards, a clear case of garlic abuse. But I loved it anyway, the fiery tingle goosed even higher by a pinch of crushed hot peppers. That swaggering Mediterranean gusto was put to good use in a number of other dishes, such as the rigatoni with oil-poached tuna, olives and capers, and the fusilli amatriciana whose tomato sauce came infused with the salty smoke of pancetta bacon. But Albertino was also capable of more subtle tunes. 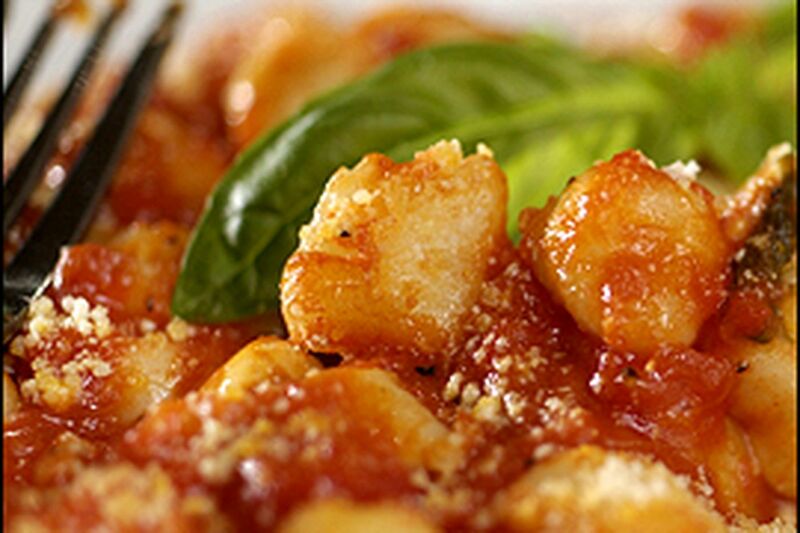 The dime-sized gnocchi were a study in delicate texture, the tiny pillows sparked (but not obscured) by a simple and sprightly marinara. The porcini risotto was intensely flavored without being heavy, as mushroom risottos often are. The kitchen wasn't flawless. The grilled calamari were terrible - already cooled when they got to the table the first time, cooked into chewy oblivion the second. An otherwise tasty rack of lamb was overcooked, which was a drag considering that it was one of the more expensive specials on a reasonably priced menu hovering mostly below $17. Usually, though, chef Alberto hit the entrees right. The veal scallopini dishes benefit from excellent cuts of meat, tender pads of thicker-than-usual veal that came dressed as Saltimbocca (fresh sage and rosemary, fontina and prosciutto) or in the Albertino style, with champagne cream, artichokes and crab. Gallelli uses a thicker cut of grass-fed veal for the porterhouse special, and it was so succulent it was almost beefy beneath a sauce of mushrooms and Barolo wine. The "Euro-duck" turned out to be a Belgian bird, smaller than most American duck breasts. But it was superbly tender, and splashed with a lovely sauce tinged sweet with Italian orange marmalade. A stuffed breast of Valdostana chicken - the kind of dish that usually ends up dry - was tender and moist, filled with a core of cheesy spinach flecked with sun-dried tomatoes. Albertino also had a nice touch with seafood. A whole pompano filleted tableside was the picture of pristine fish, its snowy white flesh scattered with cherry tomatoes and golden pools of olive oil. A thick fillet of walu (a.k.a. butter fish) came beneath an herbaceous cherry tomato sauce that was the perfect foil for the fish's lemony flesh. A similar sauce filled with crab was all the dressing needed for a nest of angel hair pasta, whose tiny threads still guarded a distinguished al dente snap. For dessert, Albertino is predictable, serving good renditions of classics such as chocolate mousse and tiramisu. Why not just pay the bill and head next door to RoseLena's for the ultimate frilly finish, a honeyed antico dolce torte wrapped in cinnamon pastry, a caramelized cannoli, or some of those "Passyunk Smores"? By the way, for the uninitiated, the neighborhood says it Pass-shunk. You might as well get it down. If new draws such as Albertino are any gauge, more diners than ever will be heading there smore.